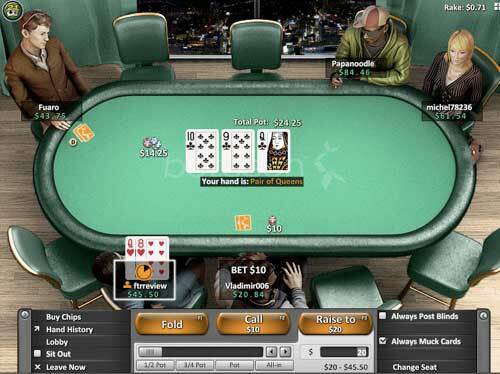 Betsson Poker Bonus Code: OPOKER1000 for up to $1,000 Free on Deposit. Over at Betsson Poker, management has decided to offer two distinct poker rooms: one on the MPN network and one on the Ongame network. After examining both sites carefully, FTR recommends using the Ongame poker client at Betsson because it offers superior bonuses. Sign up using the FTR links to make sure you qualify for any exclusive promos we offer now or in the future. After making your account, you’ll have to use bonus codes to activate your first deposit bonus and any subsequent bonuses that you want to use. 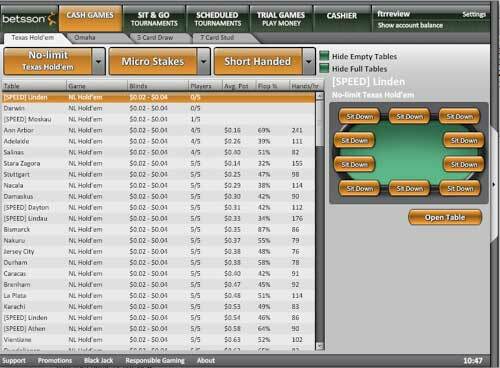 Simply enter your code into the “My Account” section while logged into the Betsson website. Betsson offers players a total of five separate first deposit bonuses to choose from. We recommend using the OPOKER1000 code to receive up to $1,000 in free bonus funds! Simply enter this code in the “My Account” page at Betsson to receive your bonus. If you choose the OPOKER1000 bonus, like we recommend, then you’ll need to earn 8,000 points to clear the entire $1,000 bonus amount within 60 days. There’s no partial payment. You must earn the whole bonus or receive none of it. Although there are two larger bonuses available, each of them is worse in some way than the one we recommend. The $1,600 bonus has an inferior clearing rate while the $2,000 bonus gives you only 29 days to complete the requirements. As you play at the Betsson tables, you’ll accumulate 3.6 Player Points per dollar in rake you pay or tournament fees collected from you. In order to fully comply with the rules for the $1,000 OPOKER1000 bonus, you’ll have to earn 8,000 points by raking $2,223. This means that you’ll be getting 45% cash back while this bonus is active! This is one of the highest possible rates available online, so you should certainly take advantage of this opportunity if it’s at all feasible for you to do so. You need only play 1,112 SNGs at $20 + $2 stakes to reach your goal of earning the whole $1,000 bonus. If cash games are more your speed, then 50,000 hands of 50nl 6-max should suffice. Read the information contained in the chart to the right of this page for more details about how quickly the bonus will clear at various stakes. With two months to complete the playthrough, it shouldn’t be too hard to reach the points goal for the $1,000 bonus. Nevertheless, you must be careful at Betsson Poker. Because there are no partial bonus payouts, you’ll have to plan carefully to make sure that achieving the necessary volume is something you can do. It may be better to err on the safe side by selecting one of the smaller bonus codes. On the other hand, if you’re a serious player, you may decide that earning one of the larger bonuses is a lucrative goal to strive for. Be aware that some of the bonuses clear at a lesser 36% rate, and be sure to incorporate this data into your predictions. As though 45% returns on the bonus were not enough, Betsson also offers a VIP feature called “The Poker Club.” Players start as Challengers and have the opportunity, through earning Player Points, to advance up to SuperPro level. Some of the benefits of this Club are being able to convert points to cash, exclusive bonuses, freerolls and more. According to the information presented at Betsson Poker’s website, SuperPro players get 40% valueback from this program! Remember to use the links on this page and the correct Betsson Bonus Code for the bonus that matches you the best when you’re ready to play at Betsson.